Match day 9 in the SPFL2 was played in glorious sunshine which was in contrast to the weather that Annan left behind. It was a crucial match for Annan who were looking to get the Cup defeat of the previous week soundly behind them and who were looking to put some clear distance between them and City . In the end Annan did enough to win the points to leave City and Cowdenbeath for the time being adrift at the bottom of the league. It was a match where Annan always appeared to be in charge and were rarely troubled defensively with keeper Jim Atkinson not being seriously tested . City struggled to penetrate the Annan defence failing to seriously test Atkinson in the Annan goal , Annan on the other hand created several scoring opportunities but in the end the game was won courtesy of 74th minute penalty scored from the spot by Aiden Smith after Andrew Blake’s clumsy challenge on Scott Roberts . City like Annan were dumped out of the Scottish Cup the previous week , Annan boss Peter Murphy reverted to his tried and trusted line up with starting places for Atkinson, Watson, Hooper and Omar all reinstated . Annan pushed forward and in the opening half hour the woodwork came to City’s recue on a couple of occasions . Both efforts were created down the right were Dan Orsi was in menacing form tormenting City full back Callum Hall. Orsi was denied by the woodwork in the 20th minute when his well struck shot from 15 yards looked to be heading for the net but fortunately for City the shot struck the cross bar . Annan continued to look the team likely to score and in the 25th minute Owen Moxon won a free kick in a promising position on the edge of the box but like so many of Annan’s set pieces in this match , Aiden Smiths attempt at the free kick sailed over the bar to safety. The woodwork once again came to City’s rescue in the 31st minute after Orsi brushed aside the challenge of Hall to finish with a well struck shot which Keeper Callum Antell managed to tip on to the post. It was another real let off for the home team who replaced Hall with the experienced McKee in an effort to contain the obvious threat of Orsi. 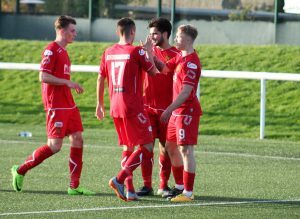 As the match edged towards half time City managed to get a couple of efforts on target through Craig Thomson and Mark Laird by neither effort seriously tested Atkinson in the Annan goal. The second half started fairly evenly and for the opening 10 minutes play flowed from one end to the other without either keeper being seriously tested. Annan could and should have went ahead in the 57th minute when Omar and Roberts combined to carve open the City defence with Omar’s releasing Scott Roberts one on one with the keeper Callum Antell who saved the day for City. It was a great opportunity lost and on another day Roberts may have taken a different option. Annan had claims for a penalty dismissed in the 59th minute when Hooper was tackled on the edge of the box. Moments later Craig Beattie created City’s best scoring effort of the game when his attempted lob landed on the top of the net, it was however a rare moment of opportunity for City. The defining moment in the match came in the 74th minute when a quick one two inside the box between Omar and Roberts enticed a tackle from Andrew Blake who’s tackle on Scott Roberts left the referee with little option but to award a penalty . Aiden Smith converted the spot kick sending Antell the wrong way. As the match edged towards full time there neither team created anything of note and Annan’s victory pushes them up to a mid table position and the defeat leaves City in a worrying position at the bottom end of the league . EDINBURGH CITY – Callum Antell, Josh Walker, Marc Laird, Craig Thomson, Craig Beattie (Ian Smith 85 min), Ashey Grimes, Callum Hall (Chris McKee 35 min),Gareth Rodger, Andrew Blake (Lewis Allen 80min ), Jesusn Garcia Tena, Stuart Morrison . Substitutes not used: Fraser Morton GK,Jordan Caddow, Shaun Harrison,Gavin Malin. ANNAN ATHLETIC – Jim Atkinson, Scott Hooper, Jack Brannan, Owen Moxon, Peter Watson, Steven Swinglehurst, Dan Orsi ( Brandon Luke 65min) , Ryan Sinnamon, Aiden Smith , Rabine Omar, Scott Roberts ( Blair Henderson 85 min). Substitutes not used Alex Mitchell (gk), John Cunningham , Peter Murphy, James Creaney, Ayrton Sonka.